Well this was my first visit to Horseshoe for the tench fishing. A few had been coming out but in deeper water of 6 ft or so. However I decided because the temperature had been close to 20c for the last few days that I would try in summer bay to see if they had started to move in there. Arriving at 6.30 I went straight to a swim that had produced for me early in the season last year. From the notes taken from my feeling around with a lead last year it didn’t take long to feel for the clear patch again. I say clear there is some silk weed on the bottom which normally disappears as the spring wears on. This year for the early part whilst there was silk weed around I was going to use the method feeder, so that the feed would lay on top of the silk weed and the tench would just come across this little food supply. The method mix was to be maggots live and dead, some molasses, vitalin and some hemp. I didn’t add to much hemp prefering to add this to the swim via a splomb. Cast out and as the sun got above the trees the temperature increased. During the morning I saw little in the way of fish activity. The only indication of anything happening was the coots picking up and dropping the plastic maggots I had hair rigged to the hook. Then from about noon onwards disaster struck, the silk weed on the bottom started to rise up of the bottom and bring all sorts of debris with it. Soon it was drifting mainly in my direction. I even but some backleads just off the rod tops but this proved to be useless. The feeders were dragged around into the weed in no time at all. The morning was fine each time I lifted the feeder there was no weed on the end now it was being covered in the stuff. Gloppy silk weed rising to the surface. As the afternoon drifted towards evening the carp were pouring in the bay and the wind stopped. However this wasn’t a happy ending. Next problem when casting was that I couldn’t sink the line properly when tightening up because of all the gloppy stuff on the surface. Since the forecast was for more sunshine and higher temps I decided to call it a day and pack away the bivvi and head for home. 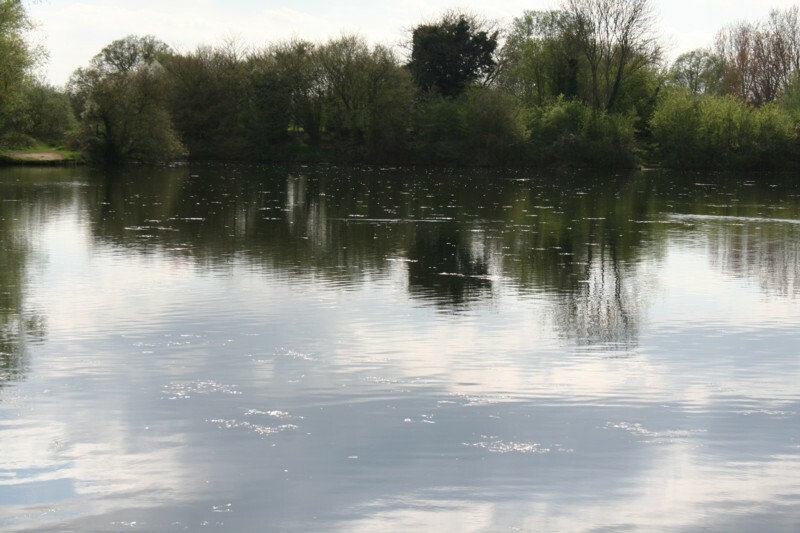 I thought that tomorrow I would fish a gravel pit closer to home where there is little weed and the tench had just started to wake. Not often I’m defeated but it’s better to dismount this lame horse rather than continue. There is plenty more time. This entry was posted on Saturday, April 9th, 2011 at 7:50 pm	and is filed under Uncategorized. You can follow any responses to this entry through the RSS 2.0 feed. Both comments and pings are currently closed.